Physician-Assisted Suicide Comes to New Jersey. Here’s Why It’s Badly Misguided. 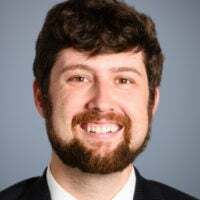 Jarrett Stepman is an editor and commentary writer for The Daily Signal and co-host of "The Right Side of History" podcast. Send an email to Jarrett. Devotion to and love of flag and country is now considered hateful. At least that was the message given by Santa Barbara City College Board of Trustees President Robert Miller when, according to a report by Campus Reform, he sent an email calling the Pledge of Allegiance “steeped in expressions of nativism and white nationalism” after the board announced it would stop saying it before meetings. While a seemingly small matter at a small school in California, it is emblematic of a larger debate that rages in America today. In a public comment by at the board of trustees’ Jan. 24 meeting, Celeste Barber, a proponent of keeping the pledge, was interrupted and shouted at by protesters while making her case. In the video of the meeting, one can hear the protesters shout things like “racist” and “slavery” while she defends the pledge. The Daily Signal sought comment from Santa Barbara City College and was directed to a Facebook post about the pledge’s reinstatement. The Pledge of Allegiance itself has a long and complicated history. The modern pledge is attributed to Francis Bellamy, a Christian socialist who wrote it in 1892 for a celebration of the 400-year anniversary of the voyage of Christopher Columbus. Congress added the words “under God” in 1952, after a public campaign from the Knights of Columbus. But the Pledge of Allegiance actually has an older antecedent. Col. George Balch, a Union Army veteran, developed a pledge for the poor and immigrant schoolchildren he taught in New York, which became the basis for Bellamy’s pledge. Balch, who, along with most of his generation, knew the value and price of freedom—and of his nation—crafted a pledge to the flag in the late 1880s. Those whose parents and ancestors had been treated as serfs in their home countries would be expected to be citizens in their new one. Quoting famed abolitionist activist Henry Ward Beecher, Balch noted in his book “Methods of Teaching Patriotism in the Public Schools” that a pledge to the flag was a demonstration of devotion to the Declaration of Independence and the Constitution. Balch intended it to be a way to show immigrants that they were welcome in their new country as well as provide a reminder that they inherited from others a great tradition of freedom that often came with a steep price. He wanted these new Americans to have an intellectual and emotional attachment to their new country. Contra the Santa Barbara City College president, and the angry activists at the school, Balch initially created a pledge of allegiance as an antidote to nativism and racism. And as a man who fought in the Union Army and quoted abolitionists, he could hardly be defined as pro-slavery. 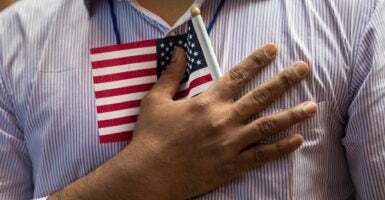 While many early proponents of the pledge undoubtedly had racial views that would not be in accordance with what we believe today, nothing about the current recitation highlights that or means that we must also adopt those ideas. If that was the case, it would be doubly problematic for American progressives. After all, the progressive movement of the early 20th century was steeped in eugenics and “scientific” racism. Perhaps it’s OK to glean the best aspects of the past rather than every aspect. Most Americans understand this, but the militant modern left insists on zealously purging any figure or concept from history that does not conform to its ever-evolving and impossible to define standards. Plus, it’s rich to hear blistering critiques of the racism of people in earlier times when, for instance, little is said to condemn the bigots and anti-Semites that infect the far-left today. In the face of these attacks on our history and reason for being, Americans must take a concerted stand against efforts to undermine public displays of patriotism, which are under assault by those who, wrongly, see attachment to country as hateful or racist. At one time, it was just the opposite. Expressing devotion to country demonstrated loyalty beyond one’s tribe or ethnic group. If America, a massive and ethnically diverse country, abandons this principle—as it is doing—our country will only face more racism, more group antipathy, and more tribalism. Are our colleges and universities, funded and supported by the American people, really doing a good job of producing able and productive American citizens? One would hope, but the fact is that many of these public institutions are fostering neither critical thought nor a patriotic citizenry. Instead, they often give free rein to radicals who violate the First Amendment rights of others with little consequence, who shout down those who disagree with them and actively suppress debate. This needs to be countered ferociously, and it can be, by citizens who have had enough of these egregious assaults on free speech. Unfortunately, many of our schools also seem to be ground zero for the effort to delegitimize patriotism and assimilation. The only “assimilation” taking place in that environment is in bludgeoning students into becoming progressives, not Americans. It is notable that the modern American “elite”—those who work in media, in corporate boardrooms, and run for office—come from institutions that have become hostile to the very idea of patriotism that is anything other than adherence to left-wing social and political views. Banishing the Pledge of Allegiance is emblematic of what is happening in schools around the country, not just Santa Barbara City College. If anything, Americans need the Pledge of Allegiance now more than ever. Moreover, we need to reject the mistaken notion that love of country comes with a hatred of others.